Summertime makes everything seem brighter and more cheerful. With the change of season came the urge to brighten up my home a bit, and since I cannot paint or buy new furniture, my best bet was to use accessories to add cheerful splashes of color. Right around the time I made this decision, I was given the opportunity to review some products from my favorite online site where I can find everything I need from cookware to tools to clothing to jewelry all at affordable prices, QVC. Pretty, but too much beige is boring! With so many great home decor products, it was hard to pick out exactly what I wanted, but after much browsing, I came across the perfect set of pillows, the Azure Demoiselle Pillow set, made by Safavieh! Perfect in that not only do they have brilliant splashes of color in the design, but they feature my favorite summertime insect, the Dragonfly! 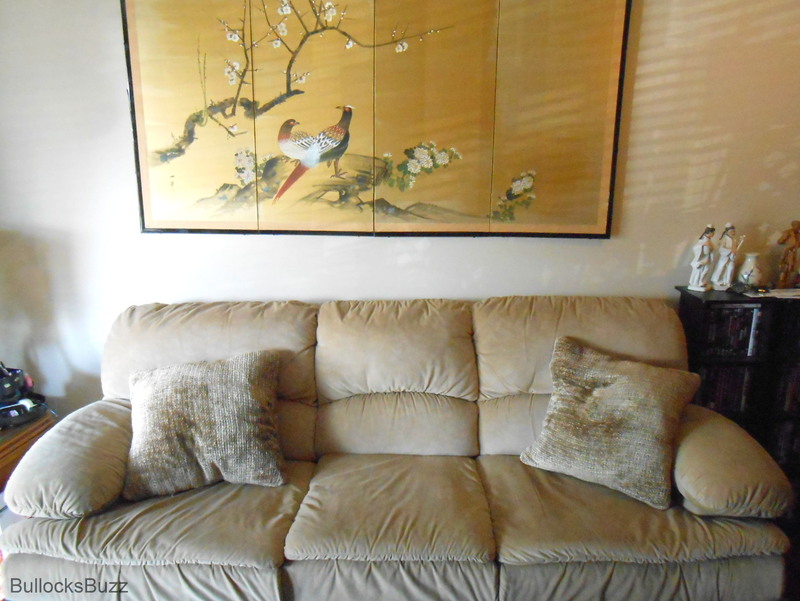 Having a beige colored couch these gorgeous pillows worked perfectly. Each one measures approximately 18″ x 18″ and has a large brilliantly colored dragonfly design on a beige-white background. 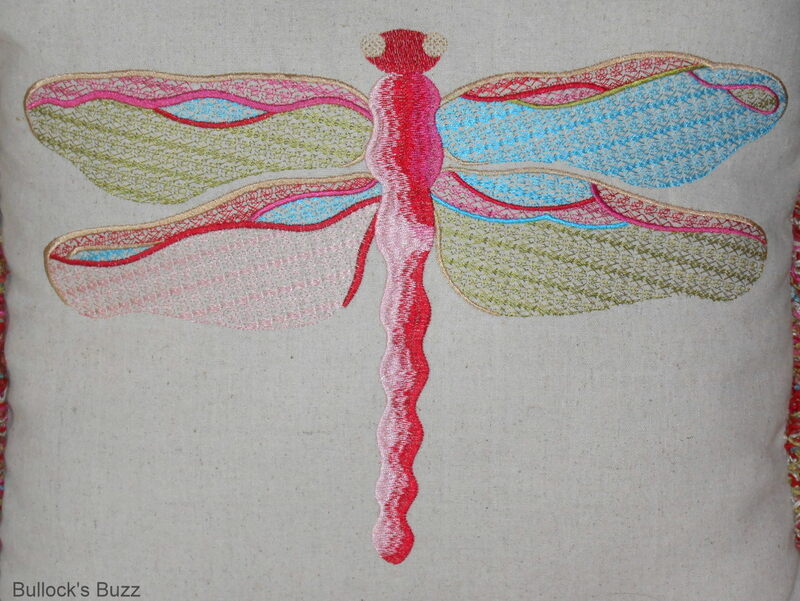 The dragonfly design was inspired by an 18th century print, and is crafted of a variety of fuscia, pink, aqua and lime green embroidery stitches. All around the edges of the pillows is a curly, multi-colored chenille fringe in the same shades of color that is found in the dragonflies. The best part is, the covers are removable and hand-washable! 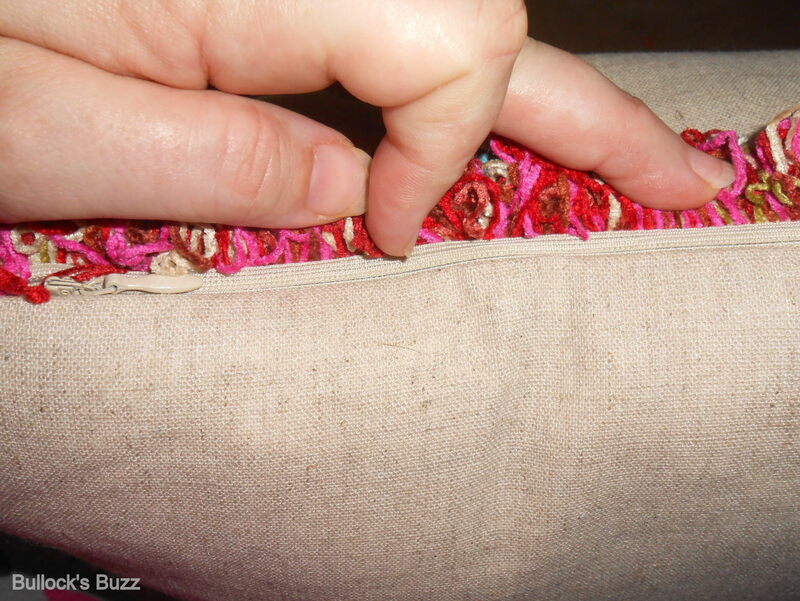 Located on the bottom edge of the pillow, cleverly hidden beneath the fringe is a small zipper which easily opens allowing you to remove the cover for washing. Each pillow is very well made. 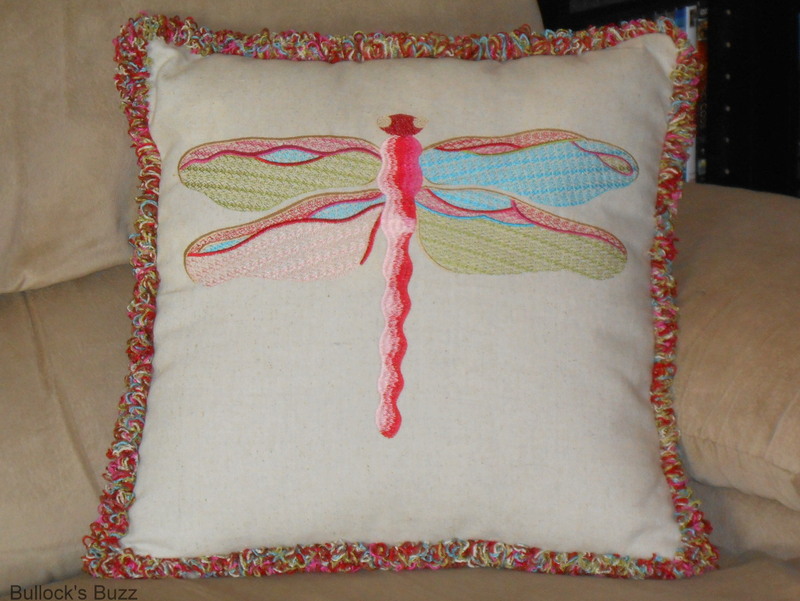 The fringe is securely intact and there are no missing or loose threads in either the dragonfly design or in the fringe; even after hand-washing, the covers are in great shape. The filler is a polyester fiber, and it is actually quite comfy to rest your head on. It is just thick enough to where the pillows remain fluffed out with no flopping or sagging so you can clearly see the entire design. Adding these pillow to the couch was the perfect touch. They pick up the coloring from the rug in front of the couch, and by adding a picture here and a vase there our den now looks much more cheerful and homey! I like the effect so much, that I may leave it year round! All I need now is a throw that picks up one of the colors from the pillows! 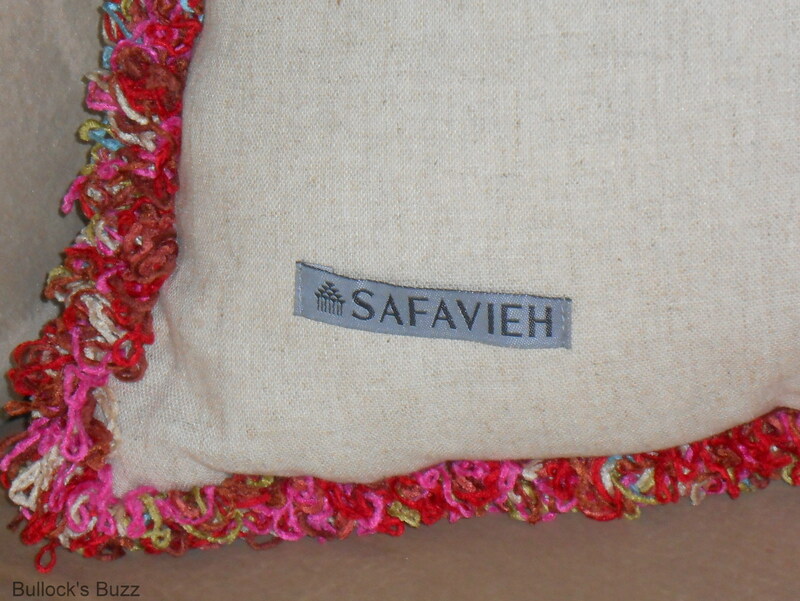 You can find these pillows as well as several other beautiful designs by Safavieh directly through QVC. Ordering through QVC online is simple and quick, and they carry brand name products at affordable prices. Whether you are looking for fashion or food, beauty products or electronics, QVC is the perfect site for one-stop online shopping! Be sure to keep up with the latest deals, promotions and more by connecting with QVC on both Facebook and Twitter. What is you favorite way to add some summer to your home?  Those also match the background on your blog. LOL! I really like those pillow! Very pretty! Oh how funny! I didn’t even notice, but you are right! Some colorful pillows can add so much to a rooms decor. Those pillows are so pretty! I have never shopped through QVC before, but those pillows are cute! I may have to check them out! I love those pillows! My daughter loves dragonflies, and we have them up on the ceiling! What a great compliment those would make in her room! What a great way to freshen up your look. The pillows look to be extremely well-made. Thanks for letting us know about this! I absolutely adore those dragonflys!! Very nice!! I think pillows are a great, easy way to freshen up a room. Each season even! LOVE those!! 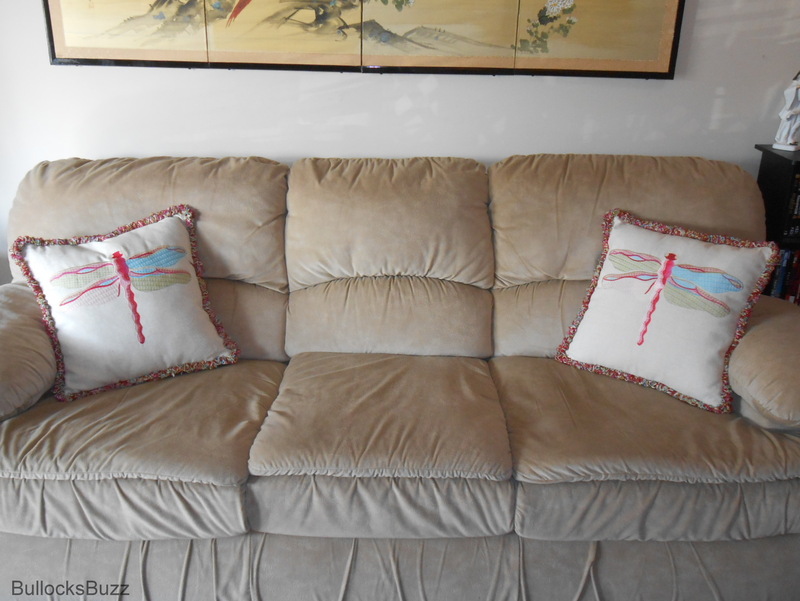 The pillow covers are great and added a nice splash of color, love them! I don’t have a way to add summer to my home. It pretty much stays the same year round. I would love to switch up my decor like you did with the pillows. Those dragonflies are lovely! Cute! I do all sorts of tricks since painting is a no-no in a rental. The wall stickers and vinyl art are pretty great, too. Very lovely pillow! I hate that I can’t paint in my apartment either, so maybe I should try getting new pillows to brighten up the room..I”m just so picky! I am very picky too! It took me a long time before I finally found what I was looking for! Those pillows are great with just the perfect punch of color and summer. I love these! They would be totally adorable in my daughter’s room! I love dragonflies! Those pillows are cute and add the perfect touch of color! I will have to check out QVC for some home decor items for our new house! I love those pillows. Very pretty and I love how they add color to your furniture and make it brighter. Nice! So cute! I love the dragonflies! Fresh flowers to the trick for me. Enjoy your summer! I change my throw pillows when I need a different look in my living room. Even with that being so simple, it’s a quick way to add in new color or patterns. 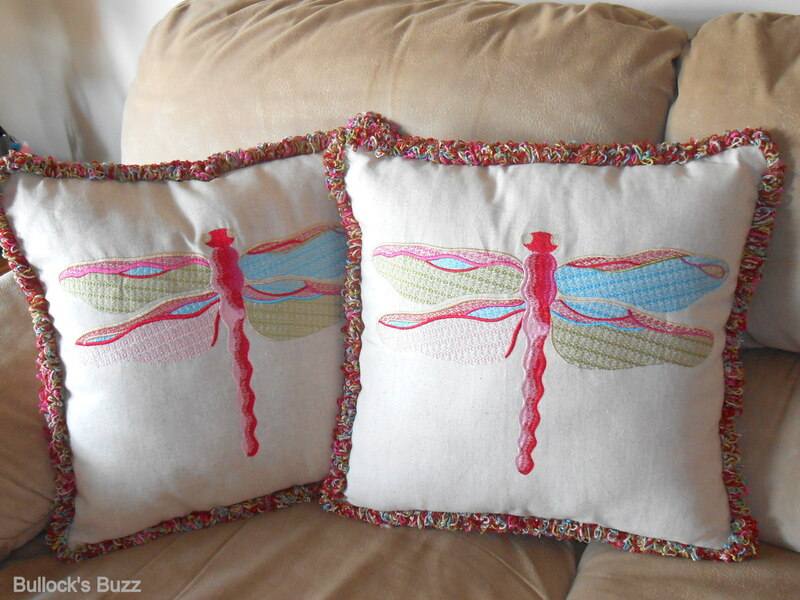 I love dragonflies and I love those pillows! !